If you’re around Times Square in New York one of these days for one of many good reasons, don’t be surprised by a giant kissing sailor sculpture placed at the intersection of 44th Street and 7th Avenue. In fact, doesn’t it look familiar? 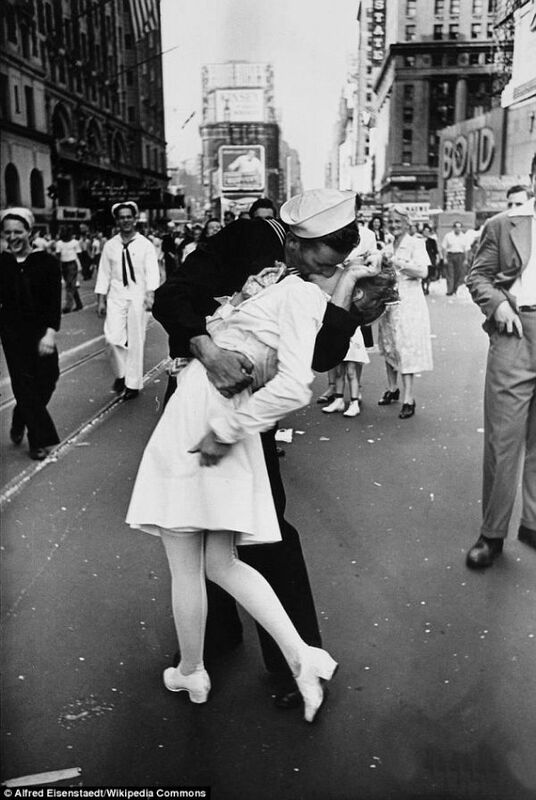 That’s because it is a three-dimensional reproduction of a very famous LIFE Magazine photo taken by Alfred Eisenstaedt on V-J Day back in 1945. The image is still used to celebrate the end of World War II, and American artist Seward Johnson will contribute to its 70th anniversary this year with this 25-foot-tall statue, called Embracing Peace. 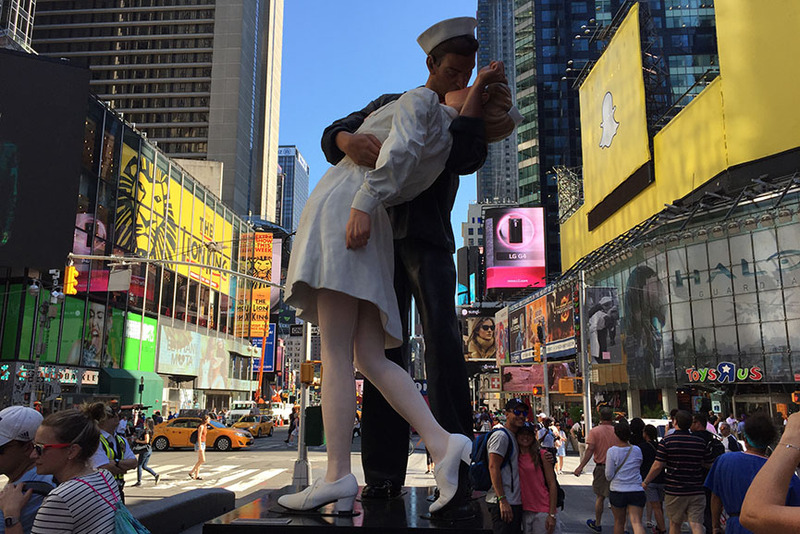 The kissing sailor sculpture in New York will also be a part of Times Square Alliance’s Kiss-In event, held every five years to honor the famous photograph with couples kissing in sailor uniforms. Previously titled Unconditional Surrender, Seward Johnson’s Embracing Peace sculpture was created in 2005 as part of a series of sculptures, and that was the first time it had appeared in Times Square in celebration the 60th anniversary of V-J day. 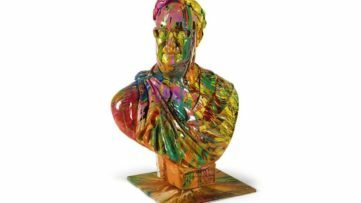 The variations of the work in styrofoam, bronze and aluminum are also on permanent view in San Diego the Garment District and Sarasota, where it was damaged after it was hit by a car. Seward Johnson’s other famous sculpture, Forever Marilyn, which shows star Marilyn Monroe in a lifted white dress revealing her legs, was on display in Chicago, Palm Springs and New Jersey. This year, the kissing sailor statue in New York will stay on view until August 16th, while the Kiss-In event will take place on August 14th at 11am between 43rd and 44th Streets, at Broadway Plaza. 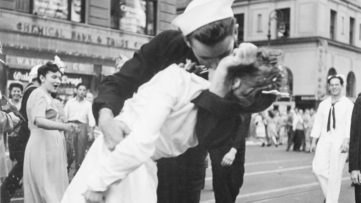 Like the photo taken by Alfred Eisenstaedt, the Embracing Peace kissing sailor sculpture in New York is also causing controversy. While on view outside the Caen Memorial Museum in France, French feminist group Osez Le Feminisme (Dare to be Feminist) started a petition to remove the statue because it actually depicted a sexual assault, rather than a romantic embrace. 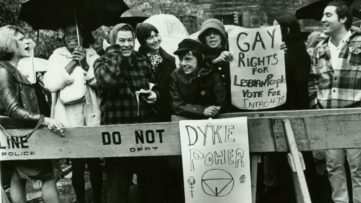 The debate on whether these claims are true or not started in 2012, when the pair shown in the famous photo was reunited on a CBS news segment. During the show, the woman in the photo, Greta Zimmer Friedman, said that she couldn’t do anything when the man, George Mendonsa, who was not her boyfriend nor did she know him at all, grabbed and kissed her, after celebrating the end of the war with a few drinks. While the identity of the nurse in question is still unclear, the fact remains that the photograph represents the symbol of a historic moment, and the kissing sailor sculpture is a fine tribute to the iconic work. Would you kiss a sailor in front of the kissing sailor sculpture in New York? Join the commentary on our Facebook page! For more art news, sign up for My Widewalls for free!